A wine holder for every need and design style. Our specialty wine racks offer a tabletop wine rack, wall wine rack and so much more. Our selection is growing all the time. Not all Specialty racks are stocked at Rosehill. You may want to check availability prior to coming into our store. 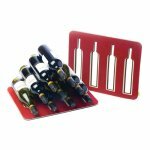 Holds 6 bottles of wine and 6 stemmed wine glasses. Union Square Wine Bottle Holder. Constructed with solid painted steel. Vector Hanging Wall Mounted Wine Bottle Rack. Made of Brushed Stainless Steel. 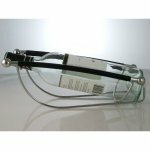 Party Stainless Steel Bottle Holder with black trim. 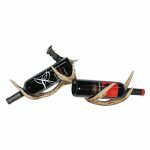 Wall Mounted Antler Wine Rack. Holds 2 bottles of wine. Coffee color Ash wood wall wine rack. Side load red Pinna solid wood wine rack. 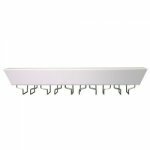 This wine holder must be fastened to the wall and is available in several sizes. 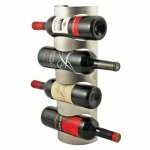 Set of 4 metal wall mount wine racks. Each metal wine rack holds 9 bottles for a total capacity of 36 wine bottles. Black metal wall wine rack that offers scrolled ends for decorative look. Each metal wine rack holds 6 wine bottles. 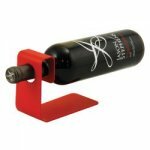 This unique wine holder adds a "twist" to your regular wine bottle holders. Beautifully handcrafted stained wood wine rack base with steel holder! Antique Brass Finish wine holder holds (3) 750mL bottles. Iron & wood wine holder for 4 wine bottles. Chrome plated metal wine glass rack holds up to 9 wine glasses. This practical wine glass rack can also be used for air-drying your stemware. 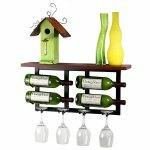 The Bamboo convertible tilt wall wine rack for wine bottle display and storage is a unique way to display your bottles and wine glasses. 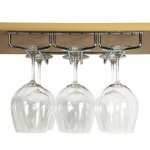 Channel Six Bamboo wine glass rack with shelf is great for small spaces. The EuroCave Modulorack is an unique system for storing your wines in their original wood cases thanks to an innovative sliding tray system. Stack your wines in a simple yet stylish way with our durable felt wine rack mat that holds up to 10 wine bottles. 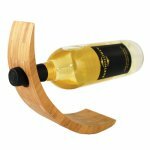 Sleek and modern Bamboo wine bottle holder for tabletop wine storage. Chrome plated steel chain wine bottle holder is magic! A unique look for displaying your favorite wine. 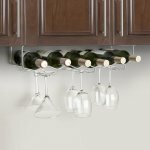 Vinolet Wall Mounted Wine & Glass Rack. Holds 4 bottles of wine and 4 stemmed wine glasses. Vintage styled wine glass holder with shelf measures 24" W x 8.5" D.
This wall wine & glass rack comes in a chrome finish and a wine bottle/glass holder insert. Wrought iron ornate wine bar for storing your wine bottles and wine glasses. The perfect addition to any room. Polished granite sculptured into a wine bottle holder makes an interesting conversation piece to be placed in your wine cellar or bar area. The wine bottle measures 48" tall and 12" in diameter, and the weight is approximately 490 pounds.